We were a family with four daughters. No boys except Rock, our dad. Even the dog was a female. And I think we’d all agree that growing up in an all girl household was pretty rad. There were lots of musical sing-a-longs and hair curling and very few bugs and snakes. And contrary to what you might think, there wasn’t a lot of catty fighting or diva behavior. My parents wouldn’t have tolerated that. We were taught to treasure our sisters and enjoy family time together. The only real ‘problem’ that arose in our household was that at some point pretty early on in my life, my two older sisters decided to gang up on me. Although they now claim to not know why (I am still convinced it’s because I’m the only brunette), they just decided I wasn’t part of their duo of awesomeness. 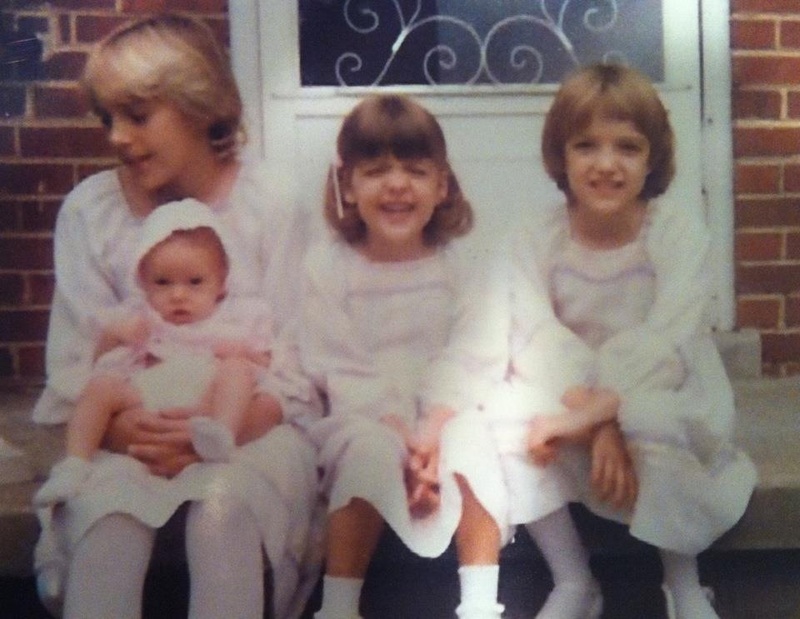 Thankfully, my parents didn’t stop at three girls, but went on to produce a fourth. When Susanna was born, I seized the opportunity to convince her that I was awesome. She agreed, or at least enjoyed my company enough to tolerate my weird quirks. While the older two were busy being ever so cool, we bonded by being ever so crazy together. We memorized our favorite movies. We made up songs. We shared a room and our dollhouses and countless inside jokes. It was so.much.fun. The only problem with sisters is that eventually you all grow up and stop living under the same roof. Now none of us live in the same state anymore. In fact, Susanna took her awesome self all the way to LONDON. While she lives a glamorous single life working at a swanky auction house, I’m still in Maryland, living 20 mins from the house we grew up in and raising my own family of (almost) four (perhaps she should have been the one teaching me how to be awesome all those years!). We love each other dearly but rarely do our schedules match up. Even then, it’s for a rushed Skype call with my children politely interrupting screaming at the screen. In person visits happen two or three times a year max. That’s why we decided to do this blog together. It’s something we can work on together. It’s a creative outlet that we both need and a fun way to document our lives. But most importantly, it’s a way for me to SEE my SISTER. We hope you’ll enjoy seeing us too. p.s. Just in case you were wondering, my older two sisters eventually accepted me and I miss them and love them just as much as Susanna. Those were wonderful days–we miss them. Being the third girl of four as well, I can totally relate! Fun read!